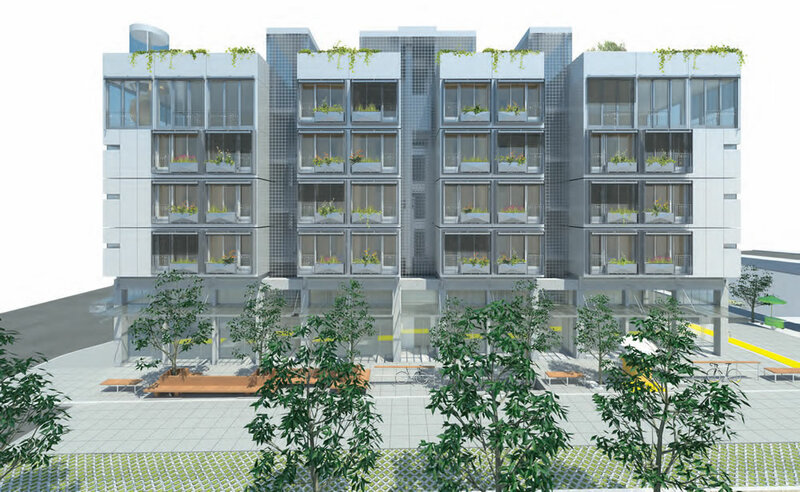 If approved, Build Inc.’s proposed “CoLiving” development to rise on a former Central Freeway parcel along Octavia Boulevard will consist of 34 residential suites averaging 174 square feet (273 square feet for the 6 handicap units) over four micro retail spaces along the street. 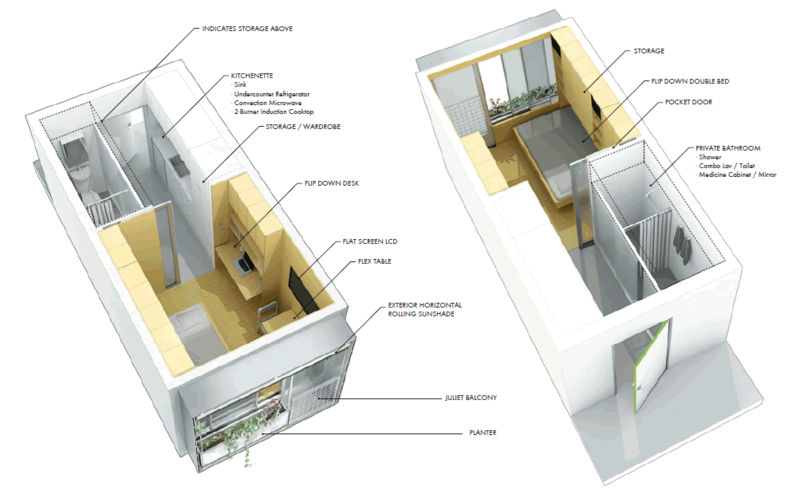 Intended to be constructed off-site in modules by Zeta Communities and then assembled on the Hayes Valley parcel, the building’s design includes shared living, dining, and kitchen areas on the top floor (and community gardens atop), but the 34 suites are designed to be completely self-contained units of housing. Each individual suite includes a full bathroom, kitchenette, wardrobe, “flex table,” and flip-down double bed, not to mention Juliet balconies and planters for a bit of green. And based on a copy of the proposal for the development, Build Inc. is projecting rents of around $1,350 a month, or nearly $8 per square foot, for each of the 34 suites with occupancy in 2017. Flipping Out: $600K More After Six Months And A Mini-Makeover? This project does nothing to solve the “housing crisis”. These units are merely hotel rooms for the young, tech crowd. This entire building should be a mix of family units (meaning 2-3 bedrooms) and senior living units. If done correctly, the drain from the lav helps refills the toilet tank and gets 2 uses from the water. If done incorrectly, a drinking fountain is added and the unit gets installed in a jail cell. So… let’s write off alternatives based on the fact that your version of the perfect plan to solve the “housing crisis” doesn’t match this one? Sound. I’m pretty sure the “young, tech crowd” need places to rent/stay as well, yea? That being said, this tiny parcel can offer housing for those that don’t need 2-3 bedrooms, which in turn frees up the 2-3 bedrooms properties that are currently being used as dorms for said “young, tech crowd”. My take, is that this plan does a fantastic job using the space available, in a fairly unique, inviting way—proficiently even. They even put the doomed garden on the roof, for the people that complained about losing that. Sounds like an all around win. Who cares if it does nothing to solve the housing crisis? Are you saying that they don’t have the right to develop something marketable and instead must be told by the city or yourself exactly what is “needed”? No, I’m trying to nice and suggest how to help solve the housing crisis. We all talk about diversity here, which means including real families. with kids. Which is what good cities ALSO are made up of. Not a bunch of tech monkeys living in a sophomore dorm on some party campus. Except they don’t have to study. They just code by day and text at night. Those sound like opinions to me, but you’re stating them like they’re facts. Including space for real families with kids? Absolutely. That’s why we should allow greater density in many areas (which you are adamantly against). There isn’t any particular reason that we should not ALSO have other types of housing built. If you build more for “tech monkeys”, they’ll bid up the rest of the housing that could go to others less. I’m for allowing choice in what is built, rather than Futurist mandate. It’s not about “right to develop something marketable”, nor about “choice”. Those terms sound so wonderful and altruistic. So noble of you. 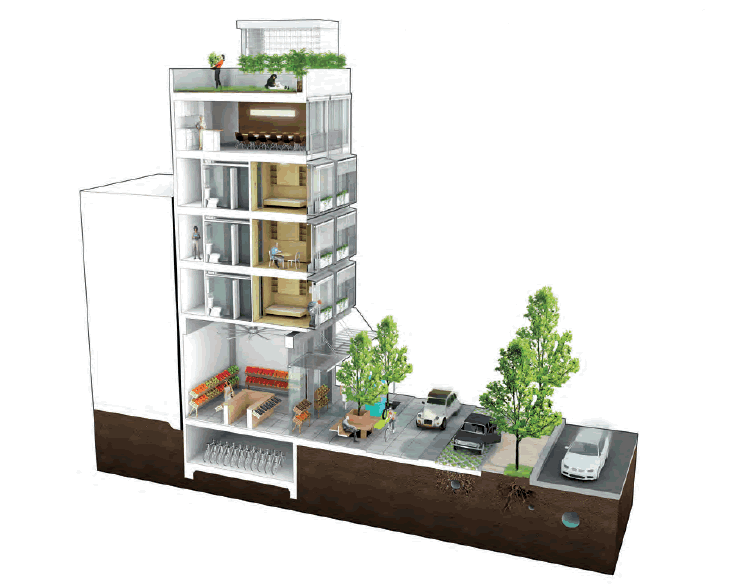 Good urban design is about appropriateness: not only physical definitions such as height, bulk and density, but ALSO about a residential mix for the kind of citizens we want to live in SF now and in the future. My point is that there should be more housing for families (even in trendy neighborhoods like the Octavia corridor, or the Valencia corridor) than more housing that almost functions as a college dorm. The focus along Octavia is all one sided. IMO, that is not responsible urban planning. Right, so you abhor the right to develop something marketable and choice for folks to buy. We get it. You’d prefer developers AND private citizens not have the choice in what they want to build or buy, and would rather force only “housing for families” to be built, in order to restrict the amount of housing built and drive up the value of your own. Understood, loud and clear. Of course not. Read what I said again. It’s about the appropriate “mix” in the neighborhoods. And it’s never about restricting the “amount” of housing, but rather the TYPE of housing. We need MORE family housing: who would disagree with that? And why you keeping wanting to make it personal by adding my own real estate into the discussion is beyond rational. Um, who would disagree with that? You. Or are you saying that you now approve of upzoning all of Noe Valley to 85′ so that more family housing can be built? you’re an idiot to engage futurist, it’s truly pointless. Futurist, I usually agree with many of your comments, but really, “Tech monkeys?” You can do better than that. People in tech are surprise, surprise, human beings! In fact, many of them stay in the city, get married, have kids, and then discover that for them, housing isn’t the issue. It’s the schools. Then they leave. My take is that if single people are provided with better housing options, they’ll be less likely to take over 2-3 bedroom units with a couple of roommates. I think a good number of people would prefer to live alone. This seems like a great option. Ok, so yea: tech monkeys is maybe not the right term, but meant to be a little playful. But it is rather funny when people get upset here (not you) when they only deal with certain opinions here and not others. Kinda weird. And then when anon wants to bring in my own house or the NV neighborhood into the discussion, when they are just not relevant. Newsflash to anon: NV will never be upzoned to 85′. period. Just not gonna happen. 99.9% of the residents will oppose it. Land and development costs are sky high. It would not contribute to “affordable family housing”. Sorry to burst your bubble, but it does no good to attack NV or other similar ‘hoods. This “tech monkey” is raising a family here and is really excited and happy about the school his children are attending. I think most people who have children and leave just don’t want to live in cramped quarters so rather than admit that, they use the schools rationale. The schools in San Francisco are fine. So, Futurist, you agree that don’t want MORE family housing built, you just want to convert this into family housing. Got it. I thought you stated that you wanted more family housing built? Wait a minute, Futurist, whenever you rail against what you call the “build it higher” crowd, you always claim San Francisco is an expensive place to live and not everyone can afford to live here. You have repeatedly stated that there is no “housing crisis”. Now there is one because you feel this building will be marketed towards “tech monkeys”? That plot of land is so small, you’re really only get a couple of family units there. I think this is a better use of the space. The word “hotel” did come to mind. You have to give them credit for maximizing the use of the space. There is not much storage so you cannot have many clothes. If this were actually a hotel though, based on SF’s average hotel rates, which are far more outrageous than rents, these would be more than $6,000 a month. So, 34 people sharing the top-floor “living room” and “big kitchen”, eh? I foresee problems. 5 obnoxious people will dominate the living room. 10 people using the kitchen will be slobs who never clean up after themselves and leave dirty dishes that stay until some fed-up person washes all of them. There are roommate problems in flats that have 4 roommates. Should be fun having 34 roommates – especially when you don’t get to meet all of them before moving in, and have no say in who moves in after you do. Hiring a professional cleaner to come, even every day, split 34 ways, does not add up to a whole lot. I assume it’s built in to the cost. Sounds like the living situation I had as a sophomore in University….I agree with EcceMorons…sounds like a disaster waiting to happen…..
Then we should absolutely make this ILLEGAL! If some random poster on the internet thinks it won’t work, then by all means we should prevent people wishing to spend their own money to build something. Let’s protect them from themselves by outlawing this immediately! Why do you have to be so nastily dismissive of people who think differently from you? The fact is that this does sound like a horrific living situation, to a lot of people. And maybe conversely it’s heaven to a few. But all people have done on here is make observations – based on experience in most cases, like MDG339 – and you immediately slam them. You really are not winning any points. I believe in allowing people to have choice, that’s all. i agree. After graduating and getting a real job, the last thing I wanted was to live in a glorified dorm. With that said, if someone wants to try to market and sell these things, I say more pwer to them. Based on some of the comments here, it sounds like some folks actually wouldn’t mind living here, so it may be a viable arrangement for some. I suppose I’m just old and clearly not the target demographic for these. can we see this in plan? i’m all for large, pedestrian sidewalks, but how does this set back relate to the rest of the blocks? These sidewalks seem massive! In the mean time a rent controlled tenant has been paying less than these rents for a 1000sf 2 BR in Russian Hill that he has hogged for 30 years for no other reason than “I was here first”. The young of the middle class is being snookered. Sad but true. Yep. And now that Russian Hill tenant has gotten married and moved his wife in, their combined income is $250,000 annually, they have over $1 million in savings, and they’re paying $900 for that 2 BR unit. And the guy in the 174 square foot unit next to a ground level freeway paying $1350 in rent is also trying to pay off his student loans. Do you guys have the same vitriol for Prop 13? Single family homes occupied by a single adult so they can keep their low property taxes, with the next door neighbor paying insane rates. My vitriol for prop 13 is even more severe. I’m not sure why most people assume that opponents of rent control are also supporters of Prop 13. Both are market distorting mechanisms that are detrimental to San Francisco’s housing stock. Because there’s a stereotypical landlord type who stumbled into a gold mine 30 years ago and is now complaining there are no diamonds. Very few people sit around theorizing about ‘market distortions’. A lot of people look at what the place next door sold for. Yes. They are both terrible measures. Yes, prop 13 is equally arbitrary and counter productive. Every zero who bought at the top of the market, and is buying during the new top of the market denounces Prop 13. Prop 13 helped many seniors keep their homes. ^Why is it taken at face value that this is a good thing? Downsizing to allow the next generation(s) to use more space is a natural thing in every culture ever. I bought at the last bottom at a discount. I am already paying around 1/2 what I should if prop taxes were based on market value. I should be fighting FOR prop 13. I should be fighting FOR rent control since what I get from my airbnb activity (> 30 days) is directly dependent on market rental rates. But I am also aware of the impact prop 13 and rent control have on SF and the relationship between the old and the young, as well as the well off and the less well off. SF is more expensive than it should be due to prop 13 and rent control. They are socially divisive and economically counterproductive measures. Needs more recreational vehicle hidabed technology. Believe it or not but many young professionals would love to live in a co-op like Cloyne. I know I would. 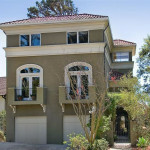 I lived in the Berkeley Co-Op when I was an undergrad and would have loved to live in something like this after college. I did move in with some some co-op friends in a big communal house, but it wasn’t the same. Something bigger like this would have been perfect. Ah, Cloyne! A few weeks in the summer were enough! I was there back when Operation Ivy was trying to get off the ground and they played (perhaps with the Offspring) in the basement at a party one evening. Maybe a 22-year-old who is used to living in dorms can deal with such horrible living conditions, but no one else wants to live in slave quarters. Eventually, these units will become slums, like the SRO hotels that house general assistance recipients and ex-felons. I’m sure that all of Tokyo will be turning into slums any day now. Different culture. Different social standards and obligations. Different history. Different country size. Sure, but the mere notion that anything small inevitably leads to slums is still ludicrous. SROs are slums precisely because of government intrusion into disallowing redevelopment, not because of the size of the units. 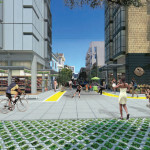 Lots of people will want to live in Hayes Valley, and without roommates. If people need more space and can afford it, 2 bedroom units are being built next door. These studios will be rented quickly. My god, San Francisco has become absolutely ridiculous. Can the city please just build cluster after cluster of high-rise housing? There is no other way to get it done. it’s time for the middle class tech folks to comprehend how bad rent control is – young people are getting screwed in this town because of it. End rent control, and see more housing built, and the quality of life improve for pretty much everyone. Stop the attack on small property owners, and see more rental available too. GET RID OF CAMPOS, AVALOS & KIM – this supervisors restrict housing opportunities, rentals & new housing. Vote in the Moderates. These creative solutions are simply an answer to the wrong premise. There is plenty of space but due to entitlements the old are crushing the Knuckles of the young on their way up. WTH is the alleged connection between ‘end rent control’ and ‘see more housing built’? Ending rent control would end the de facto lifetime lease that every current resident has, meaning that a building could be emptied within a year (or however long the longest lease is) without having to invoke the Ellis Act or pay off tenants. That would make redevelopment easier, faster, and cheaper, meaning much, MUCH more new housing could be built. Yes. A landlord could decide to charge higher than market rent to clear out a building. Tenants would move where they can afford (a novel concept in SF for many). The landlord could choose to upgrade his place, or build more units. Both good things in my book. The humane thing to do would be to allow the city to build higher- everywhere! Because this is the result we get when people complain than a corner of a tree shaded park will be shaded at 7 in the morning on a cloudy winter day. This design for the new SF County Jail is incredible. These cells while smaller than the current jail cells will definitely keep inmates more traffic calmed. The issue with the spaces is that they really prohibit one from having a group of friends over and just enjoying each other in private. Plus, it lacks storage , which means that Clothing, Food Staples, Plates, and Pans will need to be careful thought out because there is very limited storage. I think the spaces might work as a Dorm room but I question them as homes. First discernibly useful comment, Joseph. The lack of imagination from some commenters is rather sad. It’s a tiny building, and an interesting experiment with little risk. Let’s see what happens. Some people really care about restricting housing to ensure that theirs continues to increase in value at breakneck speed. I would love to rent one of these does anyone know how I can apply?